Tuan + Emily are such a classy and stunning couple! 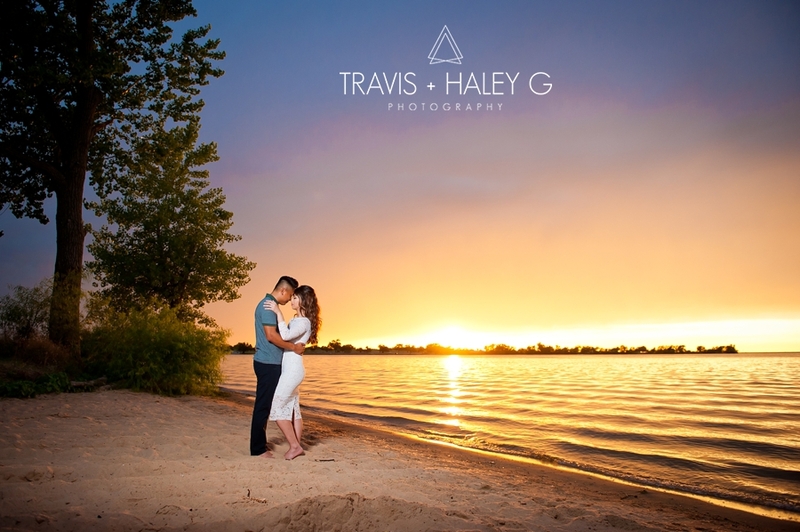 T+E were so much fun to photograph and we can’t wait to photograph their wedding at the end of the summer! At the beginning of every engagement session we always ask the couple if they’ve ever had professional photos taken (such as family photos or senior photos) and it’s always funny to hear the same phrase from every guy, “No I haven’t really ever had professional photos taken, I also don’t like getting my picture taken.” We always have a chuckle and tell the couple, “Well, don’t worry this is our first time too! Haha! But seriously you have nothing to worry about!” And by the end of the engagement session the couple, especially the guy, is always laughing and having so much fun! Professional pictures don’t have to be painful… in fact you should have so much fun on your shoot that you are excited and looking forward to your next photo shoot! We started T+E’s engagement session at the Northwest Library in Oklahoma City, OK. This was our first time photographing at this location. And I think it will be one of our new hot spots to photograph! We can claim it right?? Just kidding we will share too! There is so much photographic goodness at this library. The modern architecture is just too perfect and definitely fits with our modern photographic style! 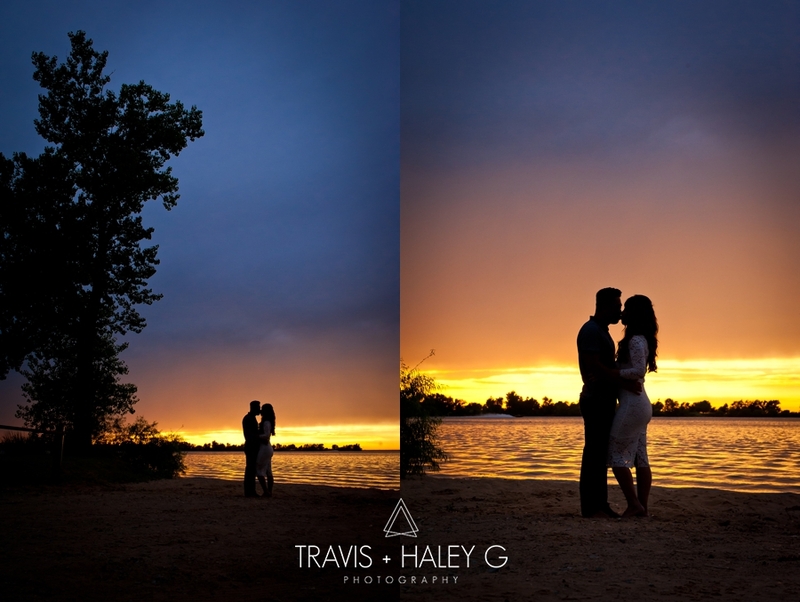 We then headed just down the street to Lake Hefner for a few more romantic portraits. 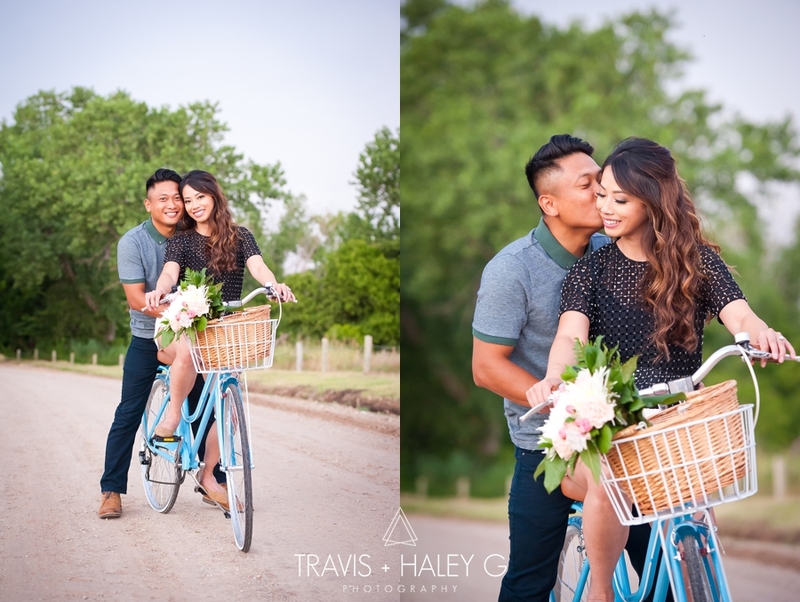 Tuan and Emily brought an adorable little sky blue bicycle with a cute basket and a fresh bouquet of flowers! 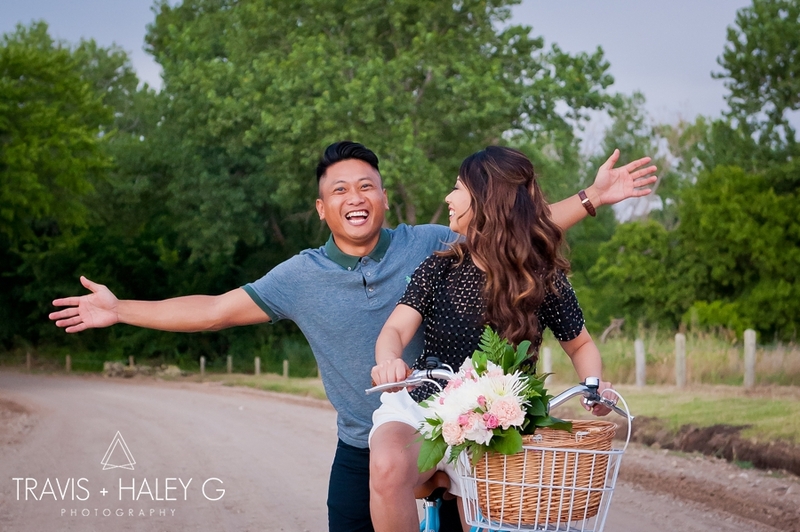 T+E had so much fun trying to ride the bicycle that they couldn’t stop laughing and being goofy and flirty with each other! We always love it when our couples bring cute props that incorporate who they are and their personalities. Next we went down to the lakeshore and we were a little concerned about the weather that evening since there was a storm rolling in. But to our surprise the rain never showed up! Instead the sun came out just before it hit the horizon and lit up all of the low lying clouds a brilliant golden yellow that made for a spectacular sunset over the water!! Oklahoma sunsets never cease to amaze us and we are always chasing after them! We were first introduced by a mutual friend back in college. We only spoke for a moment then we would not see each other again years later when we were reintroduced by the same friend. I (Emily) did not remember meeting Tuan the first time but he remembered her clearly. To me (Emily), we met five years ago when Tuan first asked me out. To Tuan, it was always the very first moment back in college. And we have been together for 5 years before we got engaged.